Earth's crust comprises of more than 4% calcium carbonate (CaCO3). It is found in forms of chalk, limestone and marble, produced by over million years of sedimentation of shells of small fossilized snails, shellfish, and coral. Although all three forms are identical in chemical terms, they differ in many other respects like purity, whiteness, thickness and homogeneity. Pure calcium carbonate can be produced from marble, or it can be prepared by passing carbon dioxide into a solution of calcium hydroxide. 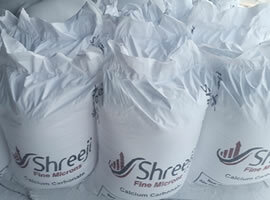 Shreeji Fine Micros pioneered the offering high quality of Calcium carbonate manufacturer in India, Gujarat, Palanpur. We offer natural calcium carbonate, which is extracted by mining or quarrying and the same is used for industrial purposes. Calcium carbonate is the most widely used mineral in paper, plastics, paints and coating industries, both as a filler, and due to its special white colour, as a coating pigment. In the paper industry it is valued worldwide for its high brightness and light scattering characteristics, and is used as an inexpensive filler to make paper bright and opaque. Filler is used at the wet-end of paper making machines, and the same filler also makes the paper bright and smooth. As an extender, Calcium Carbonate Exporter in Gujarat can represent as much as 30% weight in paints. It is also widely used as a filler in adhesives and sealants. Calcium carbonate supplier in Palanpur is widely used in food production. It is used as a dietary calcium supplement, antacid, phosphate binder, and also as a base material for medicinal tablets. It is also found on many grocery store shelves in products such as, baking powder, toothpaste, dessert mixes, dough and wine. Calcium carbonate is the active ingredient in agricultural lime, and is used in animal feed. The mineral also benefits environment, as it can be used for treating waste water. Calcium carbonate is critical to the construction industry, both as a building material on its own, and as an ingredient of cement. It contributes to the making of mortar used in bonding bricks, concrete blocks and stones, roofing shingles, rubber compounds and tiles. The mineral decomposes to form carbon dioxide and lime which are important in making steel, glass and paper. Because of its antacid properties, calcium carbonate is used in industrial settings to neutralize acidic conditions in both soil and water.